The temperature is going to be in the teens tonight, so I thought I’d fight the cold with a little baking. Mmmm…it’s been months since I made my favorite chocolate chip/toffee cookies. The recipe is from Southern Living, and I’ve posted it before, but it’s worth re-visiting. The only revision I make is to use half a bag of Nestle’s mini chips, and half a bag of Heath Brickle Bits. I bake them for 12 min, or until the edges are a little brown, but the centers look a little underdone. The cookies continue to bake on the sheet after you take them out, so don’t let the entire cookie get brown in the oven. Two of my favorite things: cookies and owls. Posted in baking, Cookies, Milk chocolate. Bookmark the permalink. Darn, I hope they get them soon. 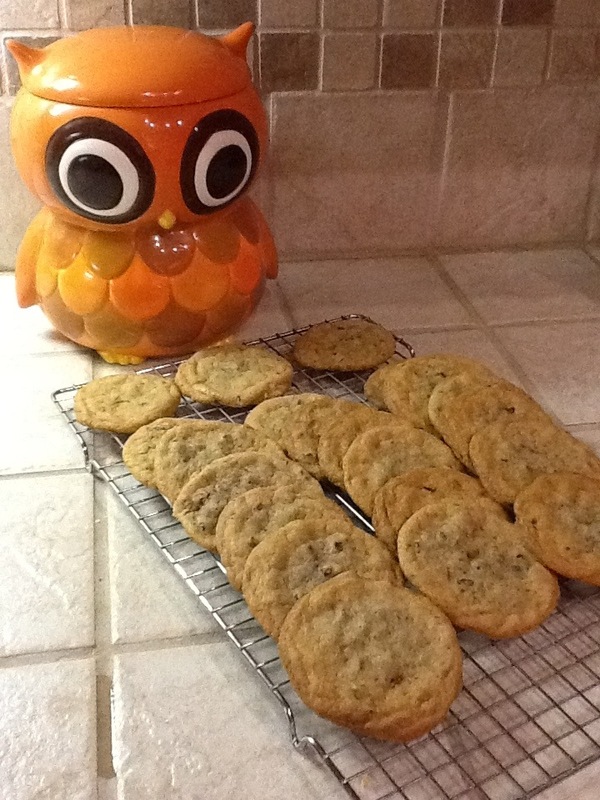 Love the owl cookie jar! Thank you, they were good to eat, too. It’s funny that you’re using your baking to heat your house while I’m avoiding baking as it’s so hot here! That is funny, and the blondies that are on your blog look amazing, I must bake them soon. Those cookies look amazing…I will have to make some soon.